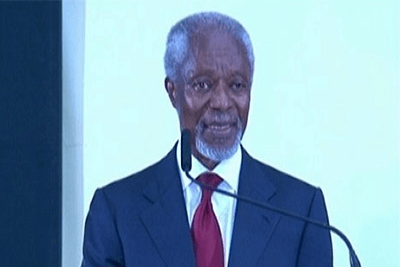 Former UN Secretary-General Kofi Annan speaks at the African Higher Education Summit in Dakar, Senegal, on March 11th. A continental summit in Dakar March 10-12 brought governments, academics, international development partners, and entrepreneurs together to develop a common vision towards transforming Africa’s higher education system. Hosted by TrustAfrica, the summit explored the challenges currently confronting the continent in terms of investment, financing, harmonization, access, quality, diversity, and graduate employability. Young Africans represent a burgeoning share of the population in many African countries; yet access to higher education trails at 7%. DAKAR, March 12, 2014 — Heads of state, ministers of education, entrepreneurs, academics and international development partners gathered in Dakar from March 10-12 for three days to discuss the priorities and challenges facing African higher education systems in the 50 years to come. Organized by TrustAfrica, the summit brought together stakeholders from across the continent to develop a common vision geared towards transforming the sector and making it more responsive to Africa’s needs in the 21st century. Dr. Nkosazana Dlamini-Zuma, Chairperson of the African Union Commission, and Macky Sall, President of Senegal, opened the summit, challenging participants to finalize a declaration of common goals for higher education on the continent. “The rate of access to higher education in Africa is trailing at 7%, compared to 76% in the West. There is an urgent need to facilitate access and build capacity in African universities,” said President Sall. According to Dr. Dlamini-Zuma, the question of the day was Africa’s ability to adapt its curricula, research, and teaching methods to a changing continent and world. Revitalizing higher education in Africa will require firm commitments on the part of governments, significant sustainable investment, broader partnerships, and a long-term vision. The summit created a platform for stakeholders to discuss just that, delving into questions of equity, access, employability, funding, partnerships, and gender. 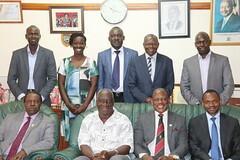 Strategic partnerships amongst African universities and international donors are also a vital part of the equation. Currently, “the World Bank invests 20% of its education budget for Sub-Saharan Africa in higher education, representing approximately $600 million,” noted Claudia Costin, Senior Director for Education at the World Bank Group, during a high-level panel on investment in African higher education. To bridge gaps in quality and retain talent, the World Bank is supporting 19 centers of research excellence in several countries in West and Central Africa, during the first phase of the flagship Africa Centers of Excellence project. “These centers, which are helping to boost science, technology, engineering and mathematics-related disciplines, are a direct response to Africa’s development needs,” said Andreas Blom, Lead Economist for Education at the World Bank. While the needs in the region—which range from adapting to climate change to fighting infectious diseases—are great, optimism for Africa’s universities, their students, and their faculty abounds. And one thing is certain, high performing education systems will play a crucial role in unlocking Africa’s full social and economic potential in the years to come. This article has been re-posted from The World Bank website: http://www.worldbank.org/en/news/feature/2015/03/12/setting-goals-to-revitalize-africas-higher-education-systems.